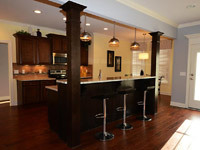 Hall’s Custom Cabinetry has provided custom cabinet solutions for home owners in the Middle Tennessee area since 2009. We are a family owned and operated business, and we strive to build every cabinet with unsurpassed quality and craftsmanship. Whether you are selecting cabinets for a new home or remodeling an existing home, our dedicated staff will design, manufacture and install customized cabinetry that meets your unique needs and lifestyle. Following an initial consultation, we provide on-site measuring and computer-generated custom drawings, and can provide expert recommendations on cabinet styles, functions, and wood types. We can also work with any specialty or exotic woods. All of our cabinets are hand built using locally sourced material in our 7,500 square foot facility in Greenbrier TN. Eric Hall is the proud owner and operator of Hall’s Custom Cabinetry. He resides in GREENBRIER, TN alongside his wife 3 daughters and son. Whatever your needs, Hall’s Custom Cabinetry can provide custom, hand-crafted cabinets that will fit your space, your lifestyle, and your budget. Call us today for a free, on-site consultation.